On January 25 at the international terminal in Naha Airport, passengers on the first charter flight provided by Xiamen Airlines were welcomed. 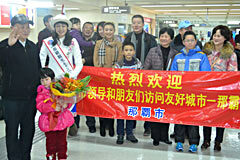 On January 25, Xiamen Airlines provided its first charter flight to Naha from Fuzhou in China’s Fujian Province. This is also the first time that a general group of travelers has come on a direct flight from Fuzhou. At the international terminal in Naha Airport, representatives from Naha City and the Okinawa Convention & Visitors Bureau held up a welcome banner before presenting commemorative gifts and bouquet flowers to the 126 passengers. The success of the visit to Fuzhou last November to commemorate the 30th anniversary of the formal establishment of friendly relations between the two cities by representatives of Naha and people involved with the prefecture’s economy led to this first group tour happening.